Label each with your name and contact information. Be sure to have extra batteries and chargers. List of model numbers or serial numbers of medical devices and equipment. Medical alert tags or bracelets and written description of your disability related or health care conditions. Medications and copies of all prescriptions, including a list of the prescription name, dosage, frequency, doctor and pharmacist. Also consider if medications need to be refrigerated and if so, bring a cooler with an ice pack or other coolant system. It might also be beneficial to have an extra prescription filled. Hygiene supplies, including absorbent pads and urinals as needed; personal grooming items such as toothbrush, toothpaste, deodorant, soap, towel, washcloth, comb and brush. Phone numbers and names of your physicians or other health care providers, health insurance information, emergency contact information including your support network members. Supplies for a service animal including food, identification tags, proof of up-to-date vaccinations and veterinarian contact. If you own a car, now would be a good time to fill it up with gas. Make plans with your family and friends in case you’re not together during an emergency. Discuss how you’ll contact each other, where you’ll meet, and what you’ll do in different situations. If you think you may need assistance during an emergency visit www.enablefortbend.com. Fill out and print a plan online here. Learn How to Prepare for and Handle Power Outages with Medical Devices here. Check all types of media – Web sites, newspapers, radio, TV – for global, national and local information. Visit www.fortbendcountyhhs.com. Check often for updates and health alerts. 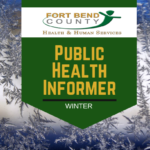 Find Fort Bend County Health & Human Services on Facebook & Twitter. Visit www.fbcoem.org and sign up to receive alerts. Check out www.texasprepares.org and www.ready.gov for more information and resources.